Euan and Murray raise a huge £600 for the MIPF! 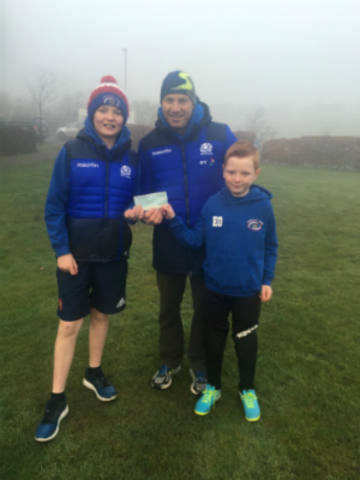 A massive thank you from everyone at the Murrayfield Injured Players Foundation to Euan Oliver, aged 8 and Murray Oliver, aged 11 who have raised a massive £600 for the foundation after attending the game where Tonci Buzov was seriously injured playing rugby. "Every year we do a coffee morning for charity, selling cakes and holding raffles. We both play rugby for Kirkcaldy wee blues and we were at the game with Hillhead when a player got badly injured. We wanted to know how he was getting on and our grandad told us about the Murrayfield injured players foundation. We thought that sounded like a really good thing, that helps injured rugby players. So we raised money for it at our coffee morning." Stuart Dow, Scottish Rugby Welfare Office, went to meet Euan and Murray to say thank you from everyone at the MIPF.